My husband has been home-brewing our family's kombucha ever since his friend Ben introduced him to the strange drink 4+ years ago. There are many recipes and methods, but this is the most basic and fail-proof that we know of. Fun fact: Nobel-prize winning Russian author Alexander Solzhenitsyn writes in his book “Cancer Ward” that Kombucha Tea cured his stomach cancer during his internment in Soviet labor camps. If it's good enough for Solzhenitsyn, it's good enough for us. 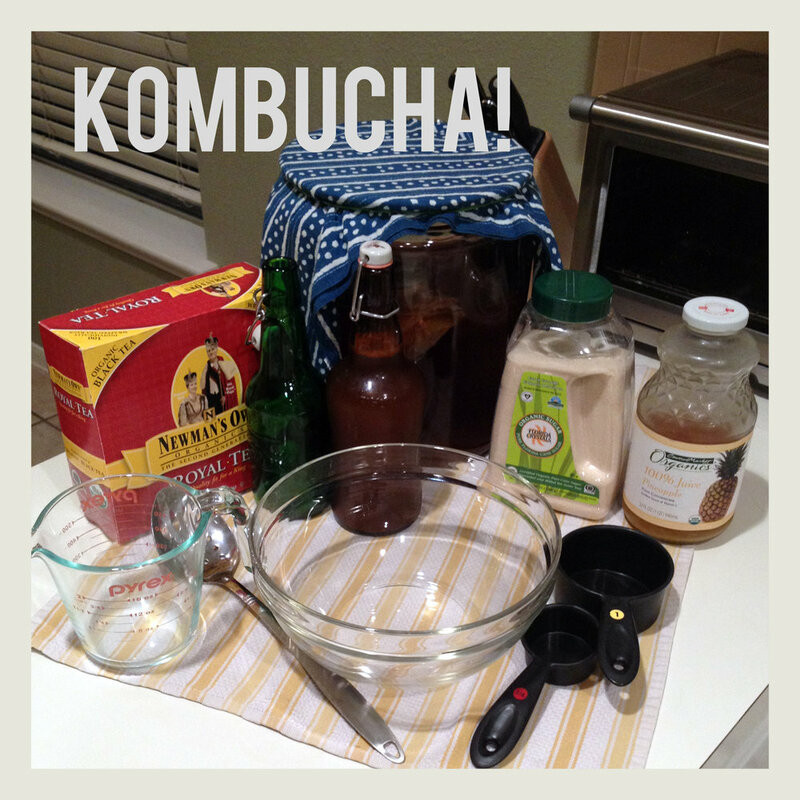 Kombucha is produced by fermenting sweet tea using a Symbiotic Culture Of Bacteria and Yeast ("SCOBY"). The yeasts consume the sugar and produce alcohol. Bacteria then ferments the alcohols into acetic acid (thus increasing the acidity while limiting the alcohol). Many health claims have focused on glucuronic acid, a compound used by the liver for detoxification. Researchers hypothesized that the extra glucuronic acid would assist the liver by supplying more of the substance during detoxification. Slimy lil' baby SCOBY. Ask a friend for one, or buy a bottle of kombucha and use the one in there. "Bath" water. This is the tea that the existing baby SCOBY has been living in. If you are using a bottle of new kombucha from the store to get started, then you will just dump the whole bottle (12-16 oz.) in. BREW NEW BATH: make Texas sweet tea, cool with ice, dump in the "baby" SCOBY along with 4-cups old bath (the "mother" SCOBY, which is thick/hard/white, gets tossed out). BOTTLE: to the old bath, add fruit juice, simple syrup, stir, and pour into bottles. Boil ~5 quarts filtered h2o in large pot. Turn off heat, add 8-10 tea bags. After 10 minutes, remove tea bags, and stir in 1 cup sugar. Wash hands and remove SCOBY from old bath. Tear off the dark brown, slimy "baby" SCOBY and add to the small glass bowl. The rest of the SCOBY can be composted, used as a chew toy (not really), or given to a friend (so they can join the fun). Add 1-2 cups of old bath to the glass bowl with the baby SCOBY. Add 2 cups of pure fruit juice (no concentrates or smoothie juices) to OLD bath (the one in the big jar). Optional: add some cooled simple syrup to the old bath for added sweetness (to your individual liking). Mix. The old bath now has new sugars and is ready to be bottled. Using 2-cup Pyrex (and maybe a funnel) pour the old bath into bottles and cap. Store in pantry or closet for a couple days, then refrigerate (or pour over ice), and enjoy! You now have a big, empty glass jar. Clean your jar before continuing your brew. Add ice to jar. Pour new, hot Texas sweet tea over ice. Stir with metal or wooden spoon. Add additional filtered h2o until your big jar is ~75% full. Now that your new bath is at ~room temp, dump in contents of glass bowl (containing the baby and some old bath). Cover w/ cloth napkin, secure with rubber band, and store at room temp. Repeat in 5-14 days. The longer the brew period, the more the sugars are consumed by the SCOBY, therefore the less sweet and more acidic the "starting bath" will be.